While I generally avoid the kitchen as the week wanes, it was not so long ago that Friday nights were set aside as regular at-home dinner dates. When the boys were young, my husband and I would retreat to the kitchen after their bedtime. At-home dinner dates were a way for us to catch up, without interruption, and to enjoy meals designed for adult palates at the end of a busy work week. Last Friday was a good time to revive the habit. The boys were away and I was yearning for a decent meal vs. the quickies thrown together all week. Long hours at work meant my husband and I had shared maybe one meal in the past week. It was a good time to catch up over an at-home dinner date. 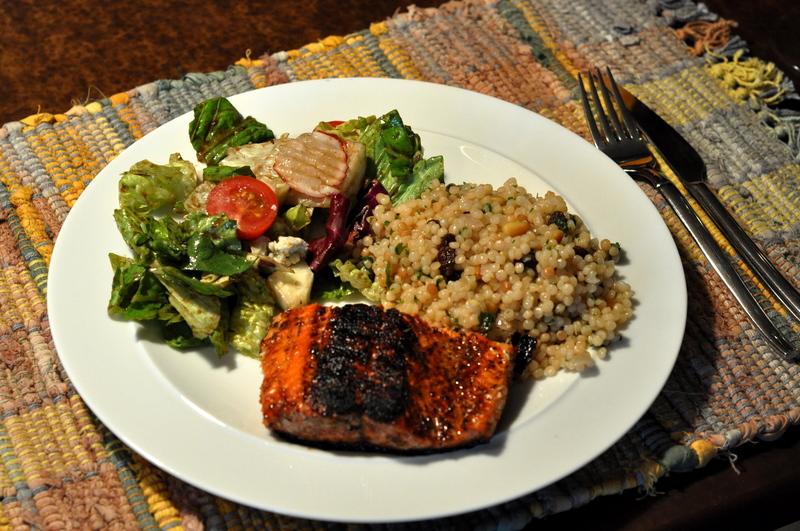 We kept it simple: Sockeye salmon fillets with a Tom Douglas Rub With Love spice rub. Israeli couscous made with a recipe on the Trader Joe’s box. A green salad with a balsamic vinaigrette offered by a friend and reader of this blog (see her version below). Simple. Tasty. Plenty of time to reconnect with the Main Man. 4 Responses to "At-home dinner date caps a hectic week"
Fun to see the vinaigrette in print! It’s a keeper – even with TJ’s balsamic as a substitute for Elsa (which is now on my shopping list). The vinaigrette was fabulous last night on roasted red potatoes and green beans. Thanks again! What a lovely tradition! I’d like to have an at home dinner date some time too! I can picture it in your charming dining room too!